Isaiah, son of Amoz, one of the Major Prophets, lived in Jerusalem, the capital of the Kingdom of Judah, between the late eighth century and early seventh century BCE, under the rule of Kings Uzziah, Jotham, Ahaz, and Hezekiah. These were the days of the First Temple, also known in modern research as the Iron Age. They were turbulent times during which the Assyrian Empire dominated the Ancient Near East unchallenged. In 721 BC, during the time of the Prophet, the Northern Kingdom of Israel was destroyed by Sargon, King of Assyria; twenty years later, the Southern Kingdom of Judah was ravaged by Sargon’s son, Sennacherib. Isaiah’s personality and prophecies, as described in biblical texts, have made the Book of Isaiah a cornerstone of both Judaism and Christianity. His words are quoted in later sources and have also found their way into prayers. In one of his most famous prophecies, Isaiah presented his vision for world peace: “… and they shall beat their swords into plowshares, and their spears into pruning hooks; nation shall not lift up sword against nation, neither shall they learn war any more” (Isaiah 2:4). The Israel Museum holds the world’s most important collection of findings from Isaiah’s era and region – the latter encompassing the general region of Judah, and Jerusalem in particular. These artifacts shed light on the material culture of Isaiah’s times, serving as a backdrop to many of his prophecies. 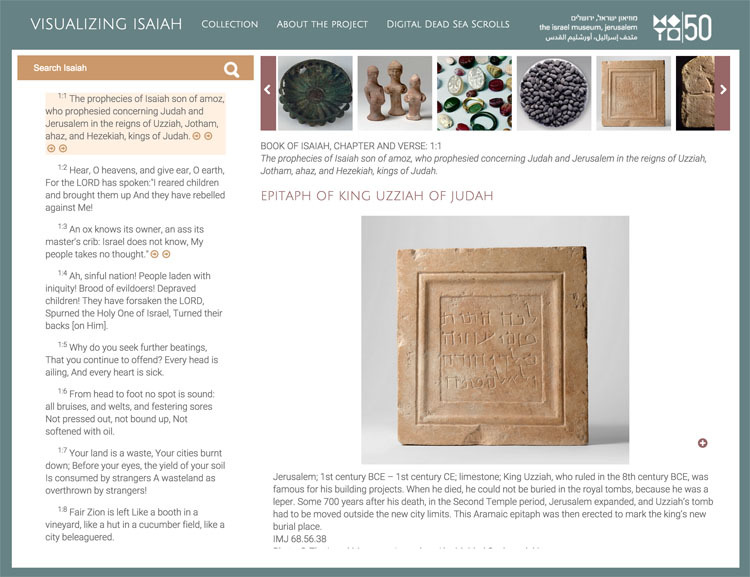 Visualizing Isaiah invites you on a journey through a rich selection of objects from the Israel Museum’s collections that portray the era of the Prophet Isaiah.